The establishment of an elite National Cycling Center in downtown Winston-Salem is nearing the starting line on renovations but remains a long way from the goal of being open by the 2017 Winston-Salem Cycling Classic. 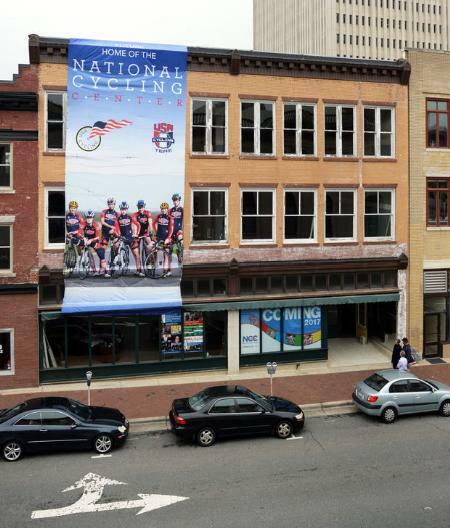 Two three-story signs have proclaimed for more than a year that the 42,000-square-foot building at 505 N. Liberty St. will be the "home of the National Cycling Center." The second floor will be dedicated solely to the center, including 10 two-person dorm rooms, a kitchen and nutrition center, a training center and an office for metabolic testing. The other floors have a multiuse component that could include residential apartments, cafes, restaurants, wellness centers and brewpubs. "This center will bring national attention and focus on our community in a very positive way," Mayor Allen Joines said. USA Cycling spokesman Kevin Loughery said that Winston-Salem has an advantageous geographic location — near the mountains and the coast, with intermediary elevations. "This site would serve cyclists in road, as well as other disciplines," Loughery said. Other disciplines could include mountain biking and cyclocross. Sterling Swaim, chairman of the board of directors for the 501©(3) nonprofit, provided the Winston-Salem Journal with a "before" tour last week of the 103-year-old building that has been the home of Brown-Rogers-Dixson Co., a Montgomery Ward retail site and a hardware store. Swaim said that most of the interior has been gutted, including asbestos abatement, as he walked along the dusty blocklong corridors. Most of the problems with permits have been resolved, according to Swaim and Joines. The next steps on what is projected to be a $5 million to $6 million project are putting in about $1 million worth of HVAC equipment, formally launching the marketing arm for the project and gearing up fundraising efforts that have taken in more than $1.5 million to date. The nonprofit is offering naming rights for each of the cycling center's main operations. "We don't want to rush the renovations for the sake of hitting a certain date," said Dr. Richard Rauck, president of the Winston-Salem Cycling Classic and the building's owner. "This will be a creative, forward-thinking center. It has to be because we're trying to attract amateur cyclists from across the country and professionals from around the nation and the world." The board is pursuing up to $2 million in federal and state historic preservation tax credits to help offset the cost. The building is in the Downtown North historic district. Achieving historic status has slowed the project somewhat, such as the requirement to clean and restore tin ceiling tiles. "We are safe on both tax credits, but we want to act because we don't want to risk another sunset" on the state credits, Rauck said. The General Assembly allowed the state historic preservation tax credit to expire at the end of 2014, but they were revived in the 2015-16 state budget and extended to Jan. 1, 2021. A 15 percent tax credit is available for qualified expenditures up to $10 million, a 10 percent tax credit for qualified expenditures between $10 million and $20 million, and a small credit for structures that don't produce income. The third floor will be converted into four residential apartments and a roof deck. Swaim's goal is filling the first floor with cafe, restaurant and/or brewpub tenants, and the basement with additional training services and what is described as a "wellness tenant." "We have talked with some local restaurants who are intrigued by the Liberty Street storefront presence," Swaim said. The mixed-use element of the center is necessary, Swaim said, because the nonprofit has to be self-sustaining financially after the initial fundraising effort. Swaim and Rauck continue to negotiate with the U.S. Olympic Committee to gain the authority to brand the center as an Olympic training venue and display the five Olympic rings. At that point, the building would be one of just two cycling-only sites in the country, Loughery said. USA Cycling already has expressed its excitement about the addition to its training facilities. Derek Bouchard-Hall, president of USA Cycling, has said the center "will be a significant asset in our work to identify and train talent." Swaim said the nonprofit is getting calls "almost daily" from cyclists — professional and amateur — wanting to know when the center's facilities will be available. Linville Team Partners Commercial Real Estate is in charge of marketing and leasing. Lambert Architecture + Interiors is handling the design. Swaim said it is important to the nonprofit that the businesses involved in the project are local. To this point in the process, he said, that has been the case. Rauck said the board is working with the city about potential parking solutions, which could include shifting the lanes on Main Street to permit diagonal parking against the building such as is used at Thruway Shopping Center. "We're exploring all options for parking," Rauck said. Rauck and Swaim say they don't want the community to think the center will be active just weeks out of the year. That's why the nonprofit has launched a youth outreach program that will offer bicycle training and safety education, encourage local schools to include biking in their physical education programs, establish programs for disabled and disadvantaged children, and even provide a way for local kids to "earn" a bike through learning how to repair bikes at the center. "Cycling represents an opportunity to increase activity levels in all our citizens, but particularly our children," Lynne Mitchell, personal health services administrator for the Forsyth County Health Department, said in the center's marketing brochure. "The center's added emphasis on underprivileged and at-risk youth is important, as activities such as cycling, which are often inaccessible, can have a significant impact on health and quality of life." Rauck said giving back is a key part of the nonprofit's vision for the center. "It'll be a home run if the center helps young people develop a lifelong interest in cycling and their physical fitness," Rauck said.